Triazol Blue RR by K. Oehler Manufacturer of Aniline Dyes Offenbach o.M. in Germany. One of a collection of colour dyes in bottles from the Colour Museum in Bradford, West Yorkshire, c.1900. New Toluylene Brown R by K. Oehler Manufacturer of Aniline Dyes Offenbach o.M. in Germany. One of a collection of colour dyes in bottles from the Colour Museum in Bradford, West Yorkshire, c.1900. Grenadine-B-B by K. Oehler Manufacturer of Aniline Dyes Offenbach o.M. in Germany. One of a collection of colour dyes in bottles from the Colour Museum in Bradford, West Yorkshire, c.1900. Cotton-Red 4B by K. Oehler Manufacturer of Aniline Dyes Offenbach o.M. in Germany. One of a collection of colour dyes in bottles from the Colour Museum in Bradford, West Yorkshire, c.1900. Metanil Yellow OOO by K. Oehler Manufacturer of Aniline Dyes Offenbach o.M. in Germany. One of a collection of colour dyes in bottles from the Colour Museum in Bradford, West Yorkshire, c.1900. Benzopurpurine 4B by K. Oehler Manufacturer of Aniline Dyes Offenbach o.M. in Germany. One of a collection of colour dyes in bottles from the Colour Museum in Bradford, West Yorkshire, c.1900. Toluyene Brown G by K. Oehler Manufacturer of Aniline Dyes Offenbach o.M. in Germany. One of a collection of colour dyes in bottles from the Colour Museum in Bradford, West Yorkshire, c.1900. Azo-Navy-Blue by K. Oehler Manufacturer of Aniline Dyes Offenbach o.M. in Germany. One of a collection of colour dyes in bottles from the Colour Museum in Bradford, West Yorkshire, c.1900. Citronine GOO by K. Oehler Manufacturer of Aniline Dyes Offenbach o.M. in Germany. One of a collection of colour dyes in bottles from the Colour Museum in Bradford, West Yorkshire, c.1900. 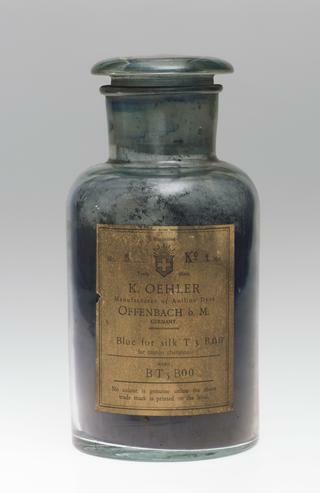 Blue de Lille by K. Oehler Manufacturer of Aniline Dyes Offenbach o.M. in Germany. One of a collection of colour dyes in bottles from the Colour Museum in Bradford, West Yorkshire, c.1900. Azo Mauve R by K. Oehler Manufacturer of Aniline Dyes Offenbach o.M. in Germany. One of a collection of colour dyes in bottles from the Colour Museum in Bradford, West Yorkshire, c.1900. Cresoline-Yellow R by K. Oehler Manufacturer of Aniline Dyes Offenbach o.M. in Germany. One of a collection of colour dyes in bottles from the Colour Museum in Bradford, West Yorkshire, c.1900. Methyl Blue for Silk by K. Oehler Manufacturer of Aniline Dyes Offenbach o.M. in Germany, one of a collection of colour dyes in bottles from the Colour Museum in Bradford, West Yorkshire, c.1900. Alkaline Blue-RO by K. Oehler Manufacturer of Aniline Dyes Offenbach o.M. in Germany. One of a collection of colour dyes in bottles from the Colour Museum in Bradford, West Yorkshire, c.1900. Orange P by K. Oehler Manufacturer of Aniline Dyes Offenbach o.M. in Germany. One of a collection of colour dyes in bottles from the Colour Museum in Bradford, West Yorkshire, c.1900. Toluylene Orange N by K. Oehler Manufacturer of Aniline Dyes Offenbach o.M. in Germany. One of a collection of colour dyes in bottles from the Colour Museum in Bradford, West Yorkshire, c.1900. Fast Red A by K. Oehler Manufacturer of Aniline Dyes Offenbach o.M. in Germany. One of a collection of colour dyes in bottles from the Colour Museum in Bradford, West Yorkshire, c.1900. Toluyene Yellow by K. Oehler Manufacturer of Aniline Dyes Offenbach o.M. in Germany. One of a collection of colour dyes in bottles from the Colour Museum in Bradford, West Yorkshire, c.1900. Triazol-Blue BB by K. Oehler Manufacturer of Aniline Dyes Offenbach o.M. in Germany. One of a collection of colour dyes in bottles from the Colour Museum in Bradford, West Yorkshire, c.1900. Benzoflavine by K. Oehler Manufacturer of Aniline Dyes Offenbach o.M. in Germany. One of a collection of colour dyes in bottles from the Colour Museum in Bradford, West Yorkshire, c.1900. Phosphine by K. Oehler Manufacturer of Aniline Dyes Offenbach o.M. in Germany. One of a collection of colour dyes in bottles from the Colour Museum in Bradford, West Yorkshire, c.1900. Toluylene Red by K. Oehler Manufacturer of Aniline Dyes Offenbach o.M. in Germany. One of a collection of colour dyes in bottles from the Colour Museum in Bradford, West Yorkshire, c.1900. Leather-Yellow G by K. Oehler Manufacturer of Aniline Dyes Offenbach o.M. in Germany. One of a collection of colour dyes in bottles from the Colour Museum in Bradford, West Yorkshire, c.1900. Mikado Orange 4RO (L) by K. Oehler Manufacturer of Aniline Dyes Offenbach o.M. in Germany. One of a collection of colour dyes in bottles from the Colour Museum in Bradford, West Yorkshire, c.1900. 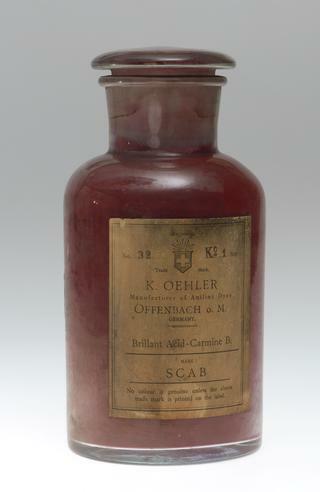 Cloth Red No 6B by K. Oehler Manufacturer of Aniline Dyes Offenbach o.M. in Germany. One of a collection of colour dyes in bottles from the Colour Museum in Bradford, West Yorkshire, c.1900.